Far be it from me to say anything bad about Japan. Years ago, I was a Junior Year Abroad student in Tokyo, and I was one of fifty-six Japanese-speaking guides who staffed the U.S. Pavilion at Osaka’s Expo 70. During that period, and on more recent visits, I have enjoyed the hospitality of many wonderful people. I feel deeply for them now. What’s going on in Japan at the moment—earthquake, tidal wave, nuclear meltdown—is nothing short of tragic. Still, a perverse part of me can’t help making the Roger Corman connection. Chris Koetting’s Mind Warp!, a helpful new history of Corman’s New World Pictures, has reminded me of the gory details. Back in 1973 Sakyo Komatsu published Nippon Chinbotsu, which translates as “Japan Sinks.” Komatsu’s novel posited a series of killer earthquakes and volcanoes that end with the submerging of the Japanese island chain. The book was hugely popular among Japanese readers, and the film version turned out to be a blockbuster, raking in $7 million at the Japanese box office. It also made a splash at the 1974 Cannes Film Festival, which is where Roger Corman came into the picture. That’s how the Corman film Tidal Wave was born. Its special effects were notoriously bad, and scenes of devastation were obvious faked. But in later years Roger—who loves “ripped from the headlines” stories—was fond of sending crews to actual disaster areas. While I was at Concorde-New Horizons, the Loma Prieta earthquake shook Northern California, and Roger quickly dispatched a camera team to film the ruined freeway and other rubble. Then the trick was to write a movie that could exploit the publicity value of the footage. We ended up with a woman-in-distress thriller called Quake. I suspect even now Roger is pondering how to get a crew to Northern Japan, so that he can announce he’s making Tsunami. New World Pictures: Let's Do the Mind Warp Again! Someone in England must really love Roger Corman. On a tip from Brian Bankston of coolasscinema.com, I stumbled onto a recent book, published in Great Britain, entitled Mind Warp! : The Fantastic True Story of Roger Corman’s New World Pictures. Since I’m a proud New World alumna, I had to check this out. Ah, the memories! Though author Christopher Koetting hasn’t spoken directly to Corman and his graduates, he has done a solid job of compiling quotes and telling details from every published book and article about the maestro’s New World days, which span the period 1970 to 1983. I’m gratified, of course, that he seems to have found my Roger Corman: Blood-Sucking Vampires, Flesh-Eating Cockroaches, and Driller Killers particularly useful. It’s always nice to feel you’ve contributed to someone else’s scholarship, especially when you’re graciously acknowledged in print. No, I don’t know Christopher Koetting from Adam (Sandler), but he’s obviously a man of good taste! Though, certainly, good taste was never the point at New World Pictures. The place was lovingly satirized by my irrepressible chums Joe Dante, Allan Arkush, and Jon Davison as Miracle Pictures: “If it’s a good picture, it’s a Miracle.” Their film spoof containing that hoary joke was entitled Hollywood Boulevard; in typical New World fashion it flaunted the tagline “The street where starlets are made.” When Joe, Jon, and Allan shot Hollywood Boulevard (in nine days, then padded it out with lots of New World stock footage), their highest goal was to photograph themselves beneath the marquee that advertised the movie. Today, to their surprise, they can all look back on significant Hollywood careers. I myself didn’t work on Hollywood Boulevard, but I plead guilty to collaborating on a lurid women-in-prison film as well as several of the infamous Corman nurse movies (“Keep abreast of the medical world with the Candy Stripe Nurses”) And—in perhaps the highlight of my New World career—I came up with the twist that ended Death Race 2000. I also rounded up the designers of those goofy Death Race cars, helped think of creative ways to run people over, and met Sylvester Stallone, dressed in ominous black for his audition as Machine Gun Joe Viterbo. It fascinates me that when Death Race was remade in 2008 as a big-budget Jason Statham action flick, the most perverse idea in the original—that drivers scored points by mowing down pedestrians—was nowhere to be seen. No one can claim that we live in a tasteful age, but the merry mayhem of Death Race 2000 was perhaps a trifle too outrageous for the 21st century. There’s something about working for Roger Corman that sends Corman alumni out to make documentary films. Even Oscar-winner Jonathan Demme (Silence of the Lambs) has recently shot a slew of docs, on subjects as diverse as rocker Neil Young, former President Jimmy Carter, and Haitian human rights activist Jean Dominique. Demme of course has industry cred that allows him to move between documentaries and star-driven dramas. But Corman graduates who are much lower on the Hollywood totem pole also seem to find docs attractive. For one thing, it’s a way for talented but little-known filmmakers to make a name for themselves. By finding and tackling a worthwhile real-life subject, they can sidestep a life of churning out schlock sitcoms and thrillers of no particular distinction. The late George Hickenlooper was a case in point. After a brief stay with Corman, he first made his mark with Hearts of Darkness, an eye-opening study of the filming of Apocalypse Now. Even while starting to be recognized for his feature film work, Hickenlooper continued to shoot documentaries, including 2003’s Mayor of the Sunset Strip (on pop music impresario Rodney Bingenheimer) and 2009’s ‘Hick’ Town, whose central figure was the energetic then-mayor of Denver. That mayor, John Hickenlooper, was George’s cousin: the obvious moral is that when you’re making documentaries it’s always smart to mine your own connections. My old buddy Rodman Flender served as Concorde head of production before going on to a modest career directing horror films (Idle Hands) and episodic television. 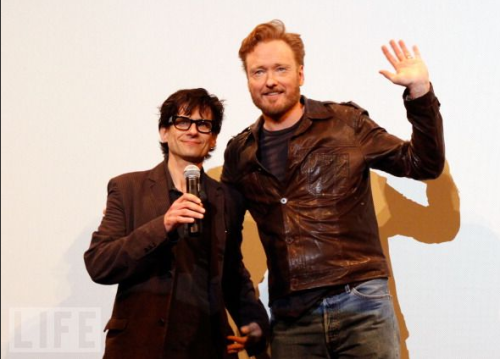 Fortunately for him, his old buddy (dating back to their college days) is Conan O’Brien. When a post-Tonight Show O’Brien took his act on the road via his “Legally Prohibited From Being Funny On TV” tour, Rodman was there to record what happened. The result is a new documentary, Conan O’Brien Can’t Stop, that has wowed the crowds at Austin’s trendy South by Southwest Festival. Which goes to prove that there’s life after Corman—and life after being named Jay Leno’s heir apparent. I brought a Winklevoss twin to the Monday night meeting of the Storyboard script development group. Storyboard is a gaggle of writers and would-be writers, all with film industry connections, who gather each month to critique scripts that are actually (for some reason or another) being made into movies. I was this month’s guest moderator. Usually it falls to me to talk about a dumb comedy like Welcome to Mooseport or the hapless Sandra Bullock vehicle All About Steve. This time, however, my luck was substantially better. I got to lead the discussion of this year’s Oscar winner for adapted screenplay, The Social Network. The room was full of people well above the age of Mark Zuckerberg, but virtually all of them have Facebook accounts. So much for the original goals of the Facebook founders! Their aim, as the movie tells us, was to be cool—and also to be exclusive. At first, no one without an Ivy League pedigree need apply. But somehow Facebook quickly became democratized. Today Harvard, tomorrow the world! The Social Network is also worth comparing to this year’s best picture winner, The King’s Speech. The two films couldn’t be more different, yet both deal with one up-to-the-minute topic: the revolution in mass communications that marks the modern era. In The King’s Speech, that revolution involved the power of radio, and its transformative effect on the British monarchy at a time of national crisis. The Social Network, at the other end of the continuum, deals with a radical shift in private communications that have become (in many ways) all too public. Adding a grace note to my talk was the presence of Josh Pence, a true golden boy who in real life rowed for Dartmouth. Josh played Tyler Winklevoss, but had the bad fortune to have his face replaced (as a sign of David Fincher’s technological derring-do) by the equally golden Armie Hammer, so they could appear on-camera as hunky identical twins. The behind-the-scenes documentary on the Social Network DVD explains the amazing process behind Josh’s loss of face. I’ve known Josh since he was five. Now he towers above me (not hard to do), and deftly charmed the Baby Boomers at Storyboard by discussing what it’s like to be a young working actor who’s featured but faceless in a hit Facebook movie. In terms of show biz, Santa Monica High School has never had half the cachet of Beverly Hills High (attended by the progeny of the old studio moguls) and Hollywood High (the home campus of everyone from Fay Wray to Carol Burnett to pop singer Brandy). Still, Samohi – the alma mater of both my father and my children – has its own connection to Hollywood glamour. The school was prominently featured in James Dean’s 1955 classic, Rebel Without a Cause. And it too has had its share of famous alumni. When the Santa Monica-Malibu Unified School District annually stages the huge student concert quaintly known as Stairway of the Stars, it always tries to bag a famous alumnus for a guest appearance. I can remember octogenarian Gloria Stuart, riding high on her Oscar-nominated role in Titanic, being so honored. One thing is certain: no one is planning to give a plaque to Samohi dropout Charlie Sheen. Sheen, I guess, has truly earned the title Rebel without a Cause. No one seems exactly sure what’s eating him. As a biographer, I’ve sometimes listed as one of my greatest passions “the mysteries of the human psyche.” Which means I’m fascinated by behavior that seems to have no rational explanation. Would I want to write a biography of Charlie Sheen? Probably not: public meltdowns make for great reading, but a biographer has to live with her subject, figuratively at least, for years on end. “The Invisible Roommate” – that’s one way I’ve heard it described. Face it: would any sane person want Charlie Sheen as a roommate? Still, the mystery keeps me intrigued. Here’s one angle: Charlie Sheen has three siblings, all of whom chose acting as a profession. One of them, Emilio Estevez, has had his own share of fame and fortune. But Estevez (who kept the family name, instead of adopting father Martin Sheen’s stage surname) has led a life that doesn’t make headlines. Why the difference? A similar question attracted me when I worked on Ron Howard: From Mayberry to the Moon . . . and Beyond. Again there were two brothers, from an acting family. Again, both were famous from an early age, Ronny on The Andy Griffith Show and his younger brother Clint as the human star of Gentle Ben. One stayed out of trouble; one took the plunge into bad behavior, then desperately needed rescuing. The question of why two siblings approach the world so differently is the sort of conundrum that biographers like me can’t wait to unravel. Well, now the silly pageantry of Oscar night is over. I’d hoped for something remarkable and unexpected, but instead there were uncharming hosts and predictable (if often well-deserved) awards. What lingers most for me was the In Memoriam section of the evening, hailing the movie legends who left us last year. What made me saddest, though, was the moment when there flashed on screen a photo of director George Hickenlooper. George died suddenly, and much too young, at age 47. I considered George a colleague and a friend. Like me, he began with Roger Corman. In George’s case, there was a brief stint as production assistant on a juicy little thriller called The Drifter (1988). Then with Hearts of Darkness, his documentary on the making of Apocalypse Now, George started gaining major attention. His reputation built as he made feature films like The Man from Elysian Fields and last year’s Casino Jack, a telling of the Jack Abramoff saga (starring Kevin Spacey) that was released after his death. But I’ll always remember George for his grace under pressure. It was a few days after L.A. had emerged from the bloody civil disturbances of 1992. Roger Corman, who loves movies “ripped from the headlines,” had summoned the press, announcing that his new film would lay bare all the causes and effects of those dark days. He introduced George as his writer-director. As the news media waited expectantly, Roger turned to George, saying, “Tell them about your movie.” George had come into the office for a simple business meeting, and there was as yet no story. But he had to say SOMETHING. Noticing a video camera in someone’s hands, he had a moment of inspiration. His film, he announced, would follow the path of a video camera as it moved from hand to hand through the L.A. streets, picking up all the chaos that the riots engendered. The newsmen were impressed, and went away to file their stories. We on the Corman creative team went to work—until Roger suddenly lost interest in the riots as a film topic. Spielberg was shooting Jurassic Park, and we were redirected to a new project: Carnosaur.